Frosty the Snowman is a thirty-minute animated television special based on the popular song of the same title. The program, which first aired on December 14, 1969 on CBS (where it has aired ever since), was produced for television by Rankin/Bass and featured the voices of comedians Jimmy Durante as narrator and Jackie Vernon as the title character. This special marked the first use of traditional cel animation for Rankin/Bass. Arthur Rankin, Jr. and Jules Bass wanted to give the show and its characters the look of a Christmas card, so Paul Coker, Jr., a greeting card and MAD Magazine artist, was hired to do the character and background drawings. The actual animation work was done in Japan, by Osamu Tezuka's studio, Mushi Production. Rankin/Bass veteran writer Romeo Muller adapted and expanded the story for television as he had done with Rudolph the Red-Nosed Reindeer in 1964. 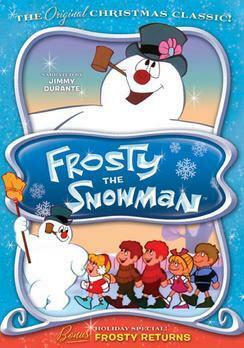 In the United States, CBS continues to hold the telecast rights to the original program (under license from the current copyright holder, Great Britain's Entertainment Rights' Classic Media division, the owner of much of the pre-1974 Rankin/Bass library) and still airs it yearly with the CBS-produced sequel Frosty Returns (see below). The CBC holds broadcast rights in Canada. The special also airs on ABC Family in some territories. However, CBS does not own the telecast rights to the 1976 sequel Frosty's Winter Wonderland (that film currently airs on ABC Family), which prompted CBS to produce its own "sequel" of sorts, Frosty Returns (see below).